I have dreaded actually sitting down to calculate how long it will take us to pay off the remaining approximately $100,000. I was afraid of what the numbers would say and what that would mean for our future. We really are enjoying our time living in my in-laws’ basement, but we still look forward to the day when we are done with student debt and can start saving for a place of our own. The bulk of our loans (about $56,000) is at a 7.9% interest rate. The next $34,000 is at 6.8%. The remaining $10,000 is currently at 2.9% interest, but will jump to a then-current rate if not paid before August 2014. I calculated a nice even $100,000 at 7.9% interest for the sake of simplicity and because I would rather slightly over-estimate and have a wee bit more wiggle room. Look at the enormous difference between paying $1,000 per month and $1,500 per month. You would pay off the loan in almost half the time, paying half the interest, for a difference of only $500 each month. For many people, freeing up $500 per month is just a matter of swearing off restaurants and fast food. Currently, my husband’s draw at work is $3250 a month (before taxes and tithing). After taxes and tithing, there is $2,633 remaining to live on and pay down our debt each month. Our secondary income stream is my very part-time Etsy shop. It has slowly grown into a monthly income we can kind of count on. There really is no telling how much I will make each month. This year has averaged around $400 per month. I have not done much to promote it. My inventory hasn’t changed much in the past couple years. Any new designs I add to the shop are usually the result of a custom order request that I take pictures of and add to my inventory. We have other occasional income from selling things on ebay, craigslist and our local facebook group. 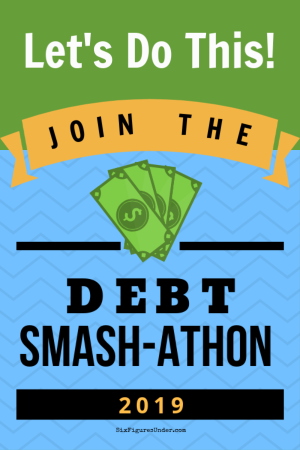 We already sold any big ticket items to put toward paying off the first $32,000 of debt. We’ve never make much more than $200 per month by selling off random household stuff. Those three income sources add up to about $3,200. UPDATE: See how our income has changed. You can also see our exact income each month in our monthly budget reports. Our goal is to pay off the remainder of our student debt in 3 years (by the end of 2016), so we are aiming at the $3,000 per month plan. Obviously this is a leap of faith since our current income would barely handle that hefty loan payment, let alone allow us any living expense. We are already have a pretty frugal and tight budget, but we are determined to make this work. Since we have pretty well shaved off any fat in our budget, our plan has to involve increasing our income. Even though my husband’s income is still fairly small, his potential is great. He has been a practicing attorney for just over 9 months. He makes 30% commission on the work he does. When he starts to consistently bring in more than his current draw, he can have an increase in his draw, so we are working on building clientele. As for my etsy shop, I have set a goal for myself that every day I will pre-make three items for my shop. I usually make all my items to order, but there are many products that sell well consistently without any customization. Having orders ready to ship frees up my time to make new products. Also, making three of the same item at a time (assembly line style) is much more efficient than making three items on three separate occasions. I will also work at increasing my other forms of side income. We would love for you for follow along with us. Are you in a similar situation? Maybe we can encourage each other? One of the benefits of blogging about our journey is the built-in accountability, even if it is to people I haven’t met! At the beginning of each month, I will give an accounting of where our money went in the previous month and the progress we have made toward our goal. We are ready to meet the challenge! We finished paying off our debt. In total, we paid $144,046. You can read our announcement to get a behind-the-scenes look at the process, see our timeline, and see what we’re doing next. Hello! Stumbled upon your blog today. I’m in a similar boat as you guys, thankfully a little smaller boat – but similar. I am working to pay off my student loans and credit card debt (after a divorce), and my love and I are living in my parents basement. No kids – yet, but someday! I look forward to reading your ways of paying the debt down! Thanks for stopping by Katy. I’m glad your boat is smaller 🙂 Living in the parents’ basement isn’t ideal, but we sure save A LOT by not having a rent or mortgage payment! Good luck with your debt paydown as well! Hi Sarah-Ashley! Isn’t it nice to know you’re not alone? Thanks for commenting 🙂 Definitely stick around and we’ll encourage each other! Hi Stephanie, I just ran across your blog and wanted to say that my wife and I are in a similar boat (except we have more student loans). I am a college professor and made the moronic idea of taking those out in grad school even though I had my school paid for and my wife came in with more loans than we do. So far, we have reduced our debt by $35000 in a year. It is a slow process, but we will get there. Good luck to you and your family. P.S. I am thinking about starting my own PF blog to chronicle our journey. Any advice. Stupid thing is I can’t come up with a title and I am not sure if I should buy our own site and go from there. Hi Jason! It sounds like you are making great progress! It is a long process, but will be so worth it! I think a blog is a great way to track your progress and stay motivated, as well as encourage others. While you are coming up with a great name, go ahead and start writing! Whether you want to self-host (we use Bluehost) or host through blogger or wordpress.com (both free), it really depends on how serious you are. If you know you’re going to stick with it and would possibly want to make money from it in the future, self-hosting is the way to go. Let me know if you have other questions. I was so happy to find your blog- I am currently in about 120K of debt with a BA in Art and MA in Museum Studies which hasn’t even led me to a full time job. Daily, I become overwhelmed with the debt over my head and seeing that there are other people out there gives me a grain of hope that I will one day, move out of my parents home and have a home with my fiance. Thank you and the best of luck to you. Thanks Maria! I was hoping that talking about debt would encourage others. It’s nice to know you’re not alone! Looking at the interest you will pay over the life of the debt is definitely overwhelming! A thirty year mortgage on a house will look a lot like that too if you calculate how much you will pay in interest. While we don’t have any car payments or house payments now, we also have about half the income. It seems like no matter how frugal we are living, there is always somewhere else we can cut. Small amounts do add up. Even if you can’t put an extra $1000 toward your debt, can you decrease your expenses and put something extra toward your loans? Here’s a post I wrote on dealing with discouragement and one on making sacrifices that might help encourage you and give you some ideas. Don’t give up Suzanne! I really believe that where there’s a will, there’s a way. You can do this! While ours isn’t student loan, we are working hard like you to pay off our mortgage. My mom is holding it and so we want to pay her off as soon as possible. This month we made a choice to pay less to her so that we could buy trees and berries for our garden. Had to look at the long term on that one but it is still hard to get off the debt payoff schedule. I look forward to your posts and for the encouragement. Welcome Natalie and thanks for following along! This is encouraging to me – after pharmacy school I was in a similar position with $160,000 in student loans. My wonderful husband married me, loans and all, soon after and we’ve been working hard to pay it off quickly. I am SO happy to say we are currently down to $42,000 in only 5 years, and that is with paying for a wedding, buying a house using a good sized down payment, and paying off two cars! My original goal was to pay it off by 2015, but since I dropped down to per diem employment after the birth of our son that goal isn’t looking as reasonable, so we’re slowing down our pace but still keeping the finish line in sight. Once the student loan is done we will begin throwing money toward our mortgage to pay that off early as well as put more toward long-term investments. Keep up the hard work, and thanks for putting your story out there! That’s some amazing progress in a short amount of time Erin! Thanks for sharing your story too! I think that’s perfectly fine to slow down a bit but still keep motivation high. It’s exciting that you’re getting so close! I completely understand I have 90,000 in debt and just a Bachelors degree (which I don’t use) to show for it. My entire paycheck goes to my student loan bills (and thats to pay it off in 10 years). So we live on my husbands check. Private colleges can be way overrated but I am conservative and thought at the time it was the right choice. That’s great that with your husband’s income you are able to put all of yours toward debt! Keep up the good work Lori! I am, also, in the same boat. $107,000 in student loan debt. I have 4 federal loans (2 subsidized and 2 unsubsidized) which total about $74k of the $107k. I am currently on the income based repayment plan so my minimum payment is zero since I only make about $35,000 before taxes. The interest rates on these loans are 6.38% and 7%. I also have 3 Sallie Mae loans that make up the rest of the total…with outrageous interest rates at 9.75%, 5% and 13%. I JUST paid off one of my Sallie Mae loans yesterday…whoo hoo…by paying $500+ towards it every month along with minimum payments on the other 3 (about $400). The Sallie Mae loans are for 10 years and I am hoping to have them paid off in 5 or less by paying almost double the minimum each month…..but the other problem is I am not currently paying my federal loans so the unsubsidized loans keep getting interest tacked on which is killing me. I recently read about the “pay as you earn” option in lieu of the income based repayment which are forgiven after 20 years rather than 25 years with the income based. I just finished my first full year at income based repayment so I am not sure if it is worth trying to change now and how much it will affect my payments. The “pay as you earn” option I believe is no more than 10% of what you earn while the income based I think is 15%….so I am not really sure what to do here. I do know, however, that this makes me sick to my stomach and makes me feel like I will never (at 35 yrs old) be able to afford to have kids or buy my own house. I constantly feel like I am going backwards with the amount that I owe. Lanna, I’m sorry that you are in the same boat. It can be pretty overwhelming when the numbers seem to grow faster than you can pay them down. It might feel like you are going backwards, but I can tell by looking at your numbers that you are making real progress! Even if you have to “ignore” the unsubsidized loans while you take care of those high interest loans, you are still coming out ahead. Try to focus on your successes. That’s awesome that you just paid off one of the Sallie Mae loans yesterday! You are making progress! Thank you for writing this post. I actually stumbled upon this site while looking up how to stretch ground beef. My husband has $25,000 in student loans. It is sickening because before our daughter was born nearly three years ago, it was half that. He recently refinanced the debt to a lower Interest, but we are still paying about $1000 extra a year. With three moves in three years, plus the bad economy, and an old clunker car, we are cash strapped. Add to that credit card debt, a rent to own situation, we are barely surviving. It is nice to be able to read how other people do it. I hate to say this, but I are tired of reading stories of people who get massive debt down but both people make $70000+ a year. It isn’t realistic for people who don’t have that kind of money coming in. I was a teacher and husband works for the board of ed as a data manager. He is make 1/3 of what most people in his position make and now, I have been laid off. To make ends meet, I walk dogs and do odd jobs with my daughter in tow as it in a too expensive to send her to daycare. Thank god for my parents. They bought us a house which we pay rent on every month which will lead to our owning of it in 10 years. They are paying for all major repairs, a new water heater, new furnace, new stove, new fridge, plumbing etc. Meanwhile we are paying for the car bills. Within the last two months, we put down nearly $3000 in repairs. We don’t have the money to buy a new car or the monthly payments. Anyway sorry for the rant. Hope and is everyone and you good luck with their debts. You are definitely not alone! You’ll make it! Just keep making the best of your situation. That’s great that you can walk dogs and do odd jobs. That’s a cool rent-to-own set-up with your parents. It sounds like you have a great support system. Best wishes! Thank you for sharing this! I hope you can accomplish your goals sooner than later. It’s wonderful to see people doing everything it takes to make things work. I wish you and your family all the best! Thanks Jordyn! I appreciate your encouragement and support! Just stumbled onto your blog! I was so excited. We are a few years out of dental school, with 4 small kids, and our six figures start with a 3. With a fluctuating income each month budgeting has become tricky. The loan repayment vs. saving for a house conversation is common in our home. I’m so happy to find a place with more helpful money saving advice than “stop your bi-monthly pedicure”. Your story is so inspiring, and thank you for sharing it! We’re in a similar boat. $133,000 in debt, includes my student loan of $28,000 at 2.75%, my husbands $63,000 at 5.75%, two vehicles totaling $32,000 at 2.45% and one home improvement loan at $10,500 at 0.00%. We have three kids and s mortgage on top of that, so we pay about $900/month in daycare and have a $1400 mortgage payment. Our goal is to pay $1000 per month on student loans until the vehicles are paid in 3&4 years, then roll that $800 onto the loan. If all goes well, we’ll be debt free in 6 years. I’m teaching myself how to be smarter about grocery shopping and couponing, plus we do a zero-based budget (but not YNAB). My eldest will be 13 when we’re done…so then we can save for her college fund so she doesn’t go through this. I hope to leave her with more financial sense than I had. 130000 in debt with a BA in psychology and a MS in social work. I am single so I don’t have an extra income to help me. I have no family to house me so I have to pay my own housing which in my location is considered great at 1100 a month. I make 2400 a month after txt never have enough money with food electric heat student loans car payment car insurance and a cell phone bill. did you pay it off! it’s Nov. 2016 right now. I m wondering how it all went! Hi Danielle! Thanks for stopping by! YES! We finished paying off our debt (it ended up totaling $144K) in July of this year. I guess I never updated this post! Off to do that now!